Unless, of course, you are Lampshading it for laughs. This is a writing or directorial choice that involves the use of character behavior, rather than blatant or thinly-veiled narration, to establish narrative elements. To show that Alice is a Badass, she would spend the entire book doing indisputably Badass things. More pertinently, the book would go into detail: for instance, the work could begin with a Batman Cold Open where she takes on six Mooks without breaking a sweat. In these circumstances, we don't have to be told she's Badass; we can see it for ourselves. To tell that she is a Badass, the narrator, Alice herself and/or other characters around her would merely state that fact. For instance, they might report on previous incidents that have happened in the past and/or "offscreen" while the other characters were busy. Or maybe there'll be no support for the statement whatsoever, but that's unlikely ("Hey, did you hear about the badass things Alice did the other day?" "No, I didn't." "Well, they sure were badass!" *crickets*). In particularly Egregious works, the narrator may state that Alice is a badass, even going so far as to include list of badass things she did, and then never mention it again or—God forbid—apply her badassery in a scene or two. If you're using a story structure or Point of View that doesn't include a narrator (such as limited third-person, in which you only see into the head of one character), showing is a far better idea, if only because having a narrator suddenly show up just to tell this stuff would break the reader's Willing Suspension of Disbelief. It's even more important in a visual medium, since people don't tend to say precisely what they're thinking or how they feel about it for a hypothetical audience's benefit; watching two characters discuss the details of something they both already know rather than making economical use of a flashback to when one or both didn't know is extremely poor storytelling. This also relates to sentence-by-sentence writing decisions that have more to do with an author's language and word choice than anything else. In general, something happens in every sentence written. Is the author merely stating those events, or describing them? "Alice was angry and upset over Bob's death" is the telling version of "Alice's heart raced as her husband slumped to the floor, blood gushing from his throat." One of these two sentences has slightly more dramatic power, and it's for reasons of impact that showing is generally advocated over telling. Now this line is sometimes quoted as an absolute gospel truth, which is not really true. It's certainly a good habit to get into (particularly in character writing; nobody likes being told what they're supposed to think of someone), but it's not an ironclad rule, and knowing when to break it to quickly explain minor details is a major aspect of learning to write. One of the best times to Tell something instead of Show it is when you want to summarize a long period of time—the written equivalent of a Time Passes Montage. Some times, one might Show so much that it becomes Too Much Information. An extension of the concept in interactive media like Video Games is "play, don't show." Rather than the player being told that the Dragon Lord killed your ninja clan and dishonored you by defeating you in a duel or being shown a movie sequence, the player is allowed to act out the journey to the Doomed Hometown and fight a hopeless duel against his far more powerful foe prior to the game proper. Rush named one of their songs after this concept. As You Know: As you know, this is when a troper like you recognizes as the act of characters giving out exposition nobody in the scene would need. Info Dump: Infodumping (that is information + dumping) is a type of Exposition that is particularly sesquipedalian. Although it can be done in a way that is unintrusive or entertaining, most infodumps are obvious, intrusive, patronizing, and sometimes downright boring. Specifically, if the premise of your story is laughably ridiculous, an infodump will call attention to the fact. This infodump, for instance. The word 'infodump' is often used as a pejorative. That Makes Me Feel Angry: it makes me sad when writers resort to just having their characters say what they feel in so many words. Explaining Your Power to the Enemy: When a character's power is spelled out by that character, rather than made clear through visual representation. And That's Terrible: when the narrator reminds the audience, in case they missed it, that what the villain did was terrible. Which is a bad device and shouldn't be used. Meaningful Name: a quick (some might even say lazy) way to let us know what a character is like. Narrating the Obvious: when a story shows and tells. Said Bookism: "In which the nature and intention of dialogue is told by the dialogue tags as well as by the dialogue itself," The All The Tropes page did vocalize speechlessly with passion and vigor. Continue Your Mission, Dammit! : There isn't much time left because people keep telling you there isn't much time left. You have 35 seconds to finish this page. Designated Hero: When we've got nothing but the narrative's word for it that the fellow the book follows is, in fact, the good guy. Designated Love Interest: When we've got nothing but the narrative's word for it that the fellow the book follows is, in fact, romantically attached to the heroine. Designated Villain: Likewise, the character in question has never done anything especially villainous, but the narrative leaves no room for doubt. These two often come in pairs, though you can have one without the other. Faux Action Girl: We're told she's a Badass, but it certainly doesn't look that way. Hollywood Homely: Casting an attractive actor or actress to play someone who's supposed to be bland looking or even downright ugly. Hollywood Pudgy: Alice is of ideal or slightly below ideal weight, has broad shoulders, and has round cheeks. Alice is fat. Informed Attribute: We are told that Alice is smart/funny/ugly/pretty/can turn into a bat but we never see any evidence for this. Informed Ability "...and Alice, who could turn into a pink butterfly on a whim, dragged herself out of bed and drove to work." Informed Attractiveness: Alice is described as drop-dead gorgeous in story, but the audience doesn't really react to her that way. Informed Deformity: "Alice and Bob might both have been stick figures, but by God he was hideous." Informed Flaw: You are blind. Informed Judaism: "Oy vey", said Alice, munching on a bagel. "Didn't you guys ever notice I don't go to church on Sundays?" Bob replied, "I noticed you don't go anywhere on Saturdays, either!" Informed Loner: "I don't like being around others," said Alice to Bob and 20 of their very best friends. On being told this, nobody left the room. Informed Wrongness: Bob told Alice that the moon orbits the Earth, ignoring the clear evidence she'd presented that everything in the universe orbited her. Well, we can't all be smart like Alice. The Pirates Who Don't Do Anything: Have a job which would involve distinctly non-heroic behavior for your hero? Don't worry, just don't have them do it. It's not like killing people is an important part of being an assassin anyway. Cutscene Power to the Max: Your character is significantly more able when you're not playing as him. Cutscene Incompetence: Your character is significantly less able when you're not playing as him. Gameplay and Story Segregation: The game mechanics don't work the same way the storyline does, or the story doesn't match the way the player is allowed to behave. This often comes across as the game simply ignoring whatever the player is doing to tell a fixed, immutable storyline. 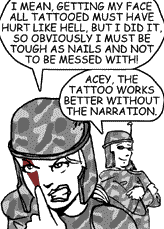 Discretion Shot: Writers imply that something violent or sexual happened without showing it to avoid censorship. Great Offscreen War: Not every writer can convincingly depict a war. Especially if they have no experience with the subject. Informed Conversation: The "would otherwise be repeating what the audience has seen already" and "distill the plot" variants. Noodle Incident: Writers don't even tell the details, to let imaginations fill in the gaps. Noodle Implements: Stating items used, but not how, to let imaginations fill in the gaps. Nothing Is Scarier: when the writers use our imagination to make us fear. Take Our Word for It: Writers describe something they can't possibly live up to by showing it, so they just tell us what it's like, and let our imaginations fill in the gaps. This page was last edited on 22 February 2015, at 22:07.